Apart from the legendary blue waters and amazing marine life, the next best thing about being in the Maldives is the food. If you are wondering what food is like in the Maldives–just think of all the freshest fruits and seafood you ever had in your life. Multiply the goodness triplefold. That’s what it’s like. 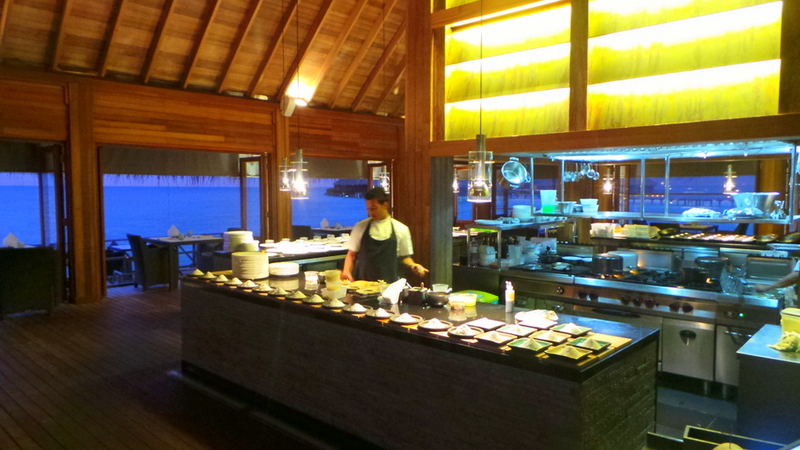 For a seafood lover like me,every meal in the Maldives is a feast as seafood is freshly caught from the Indian Ocean. 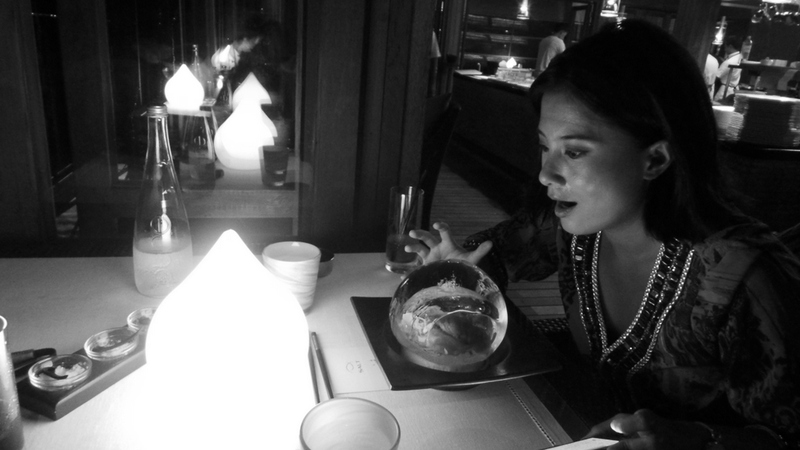 One of our last dinners in the Maldives was particularly special. 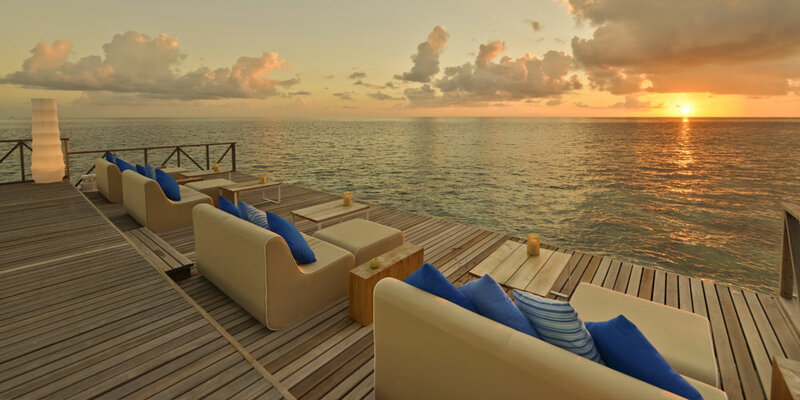 We were staying at the spectacular Huvafen Fushi, and as it happens, they hold a Sakura Japanese experience with a nine course degustation menu. 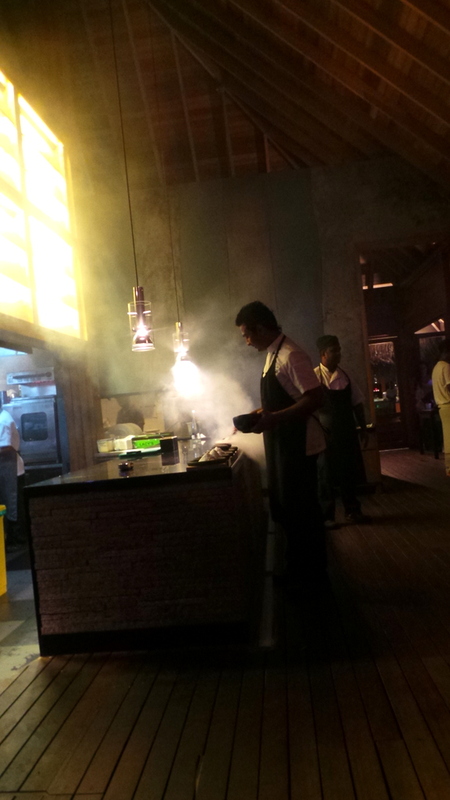 To begin the evening, we started at Raw , a very chilled out overwater location for drinks and dining. 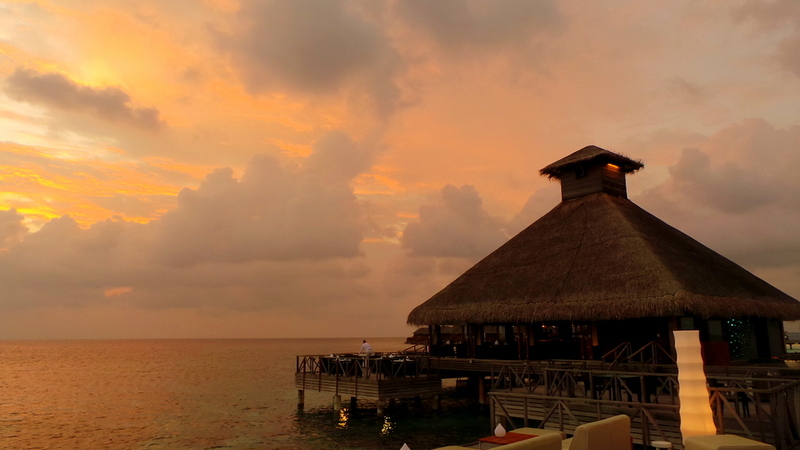 The overwater location of Raw makes it an amazing venue to watch the sunset after a long day of swim. What made this moment even better was Raw’s plated shots. The perfect aperitif to our degustation meal. 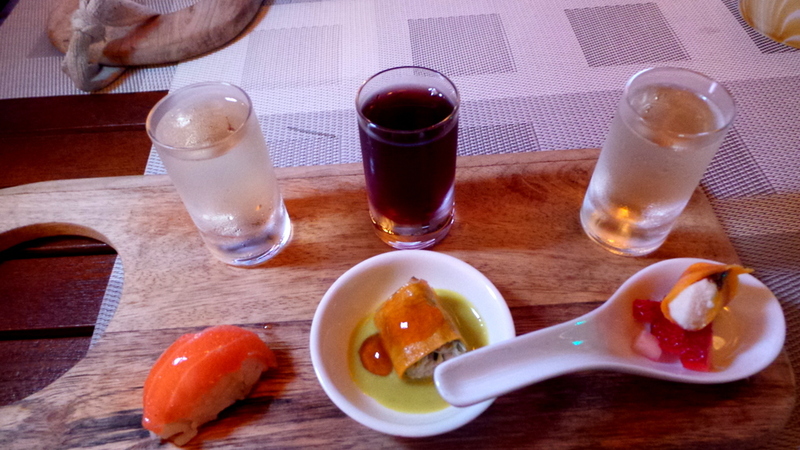 Plated Shots are a cool combination of pre-drinks with appetizer. “Gastro mixed with Mixology” was the definition by Raw. 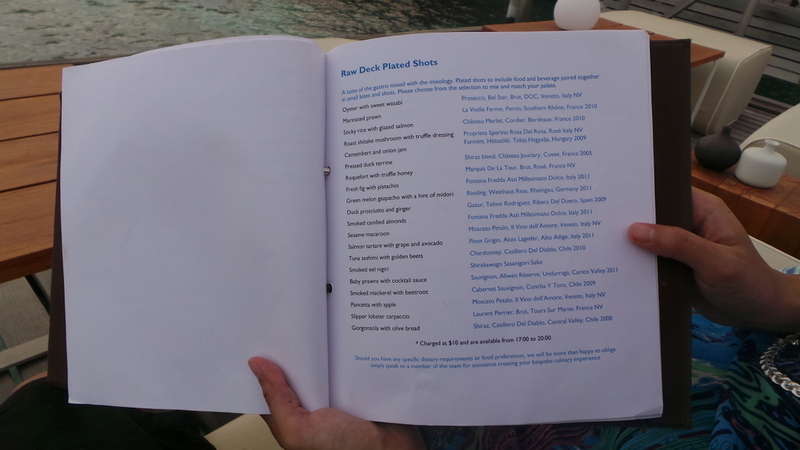 The menu consisted of entrees on the left side, to pair with shots of your choice to the right. As I don’t normally drink, I left it to the expertise of our waiter and bartender to choose which shots go best with my spoonful appetizer of choice. For the gastro part, I chose Sticky Rice with Glazed Salmon, Salmon Tartare with Grape and Avocado and Roast Shitake Mushroom with Truffle Dressing. The spoonfuls and shots were just the perfect combination and complemented each other. 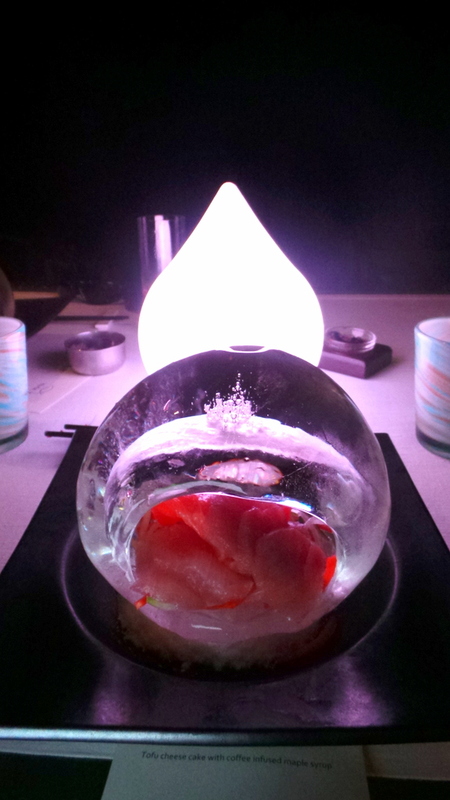 The 2 salmon picks had a sake-based accompanying shot to it , and the mushroom a red wine base. The shots may be strong but it definitely stirred up my appetite. And rightly so because just as the sun almost completely disappeared, we were called to transfer to Salt, where the degustation meal is to take place. The degustation meal promptly started at 1930, and all the diners proceed through the course at the same time. It’s an open kitchen set up at Salt, and there’s a kind of thrill that goes when you see food that’s being prepared so very meticulously. 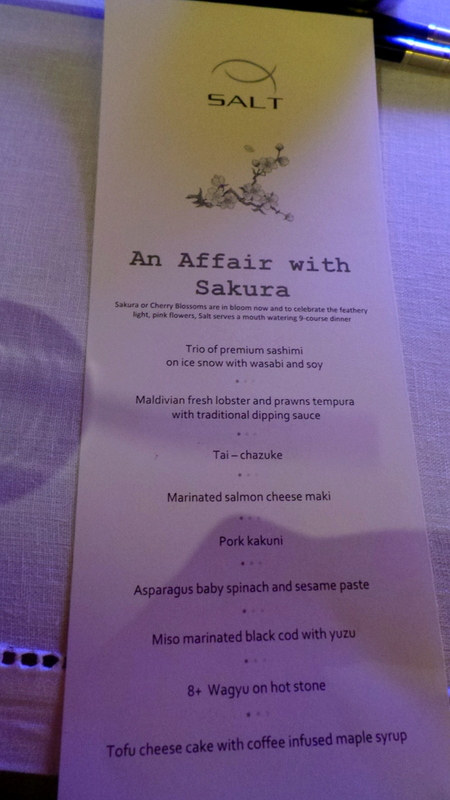 The 9 course menu had a good balance of all Japanese goodness – tempura, sashimi, soup, vegetables, and wagyu. Here are some of the dishes that took our breaths away, not just in taste but in the excellent and creative presentations. And the piece de resistance among them all for me is the 8+ Wagyu in hot stone. It’s quite ironic for me to say this because given the choice, I would choose seafood over meat. But this perfect Wagyu is top pick for me this evening. 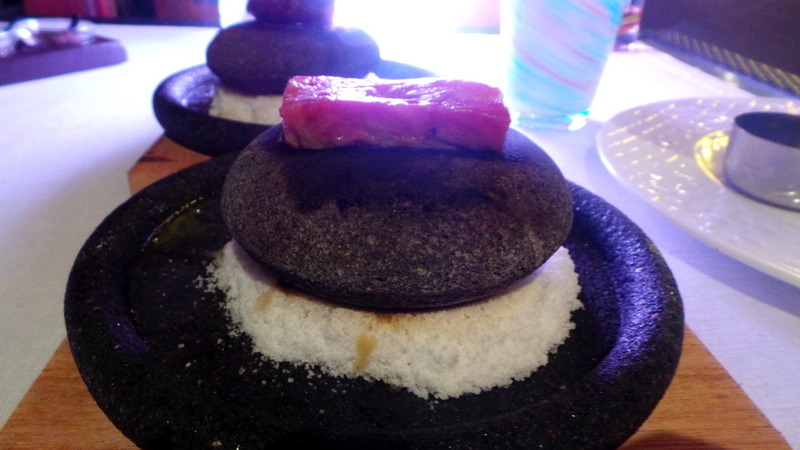 The blocks of wagyu were golden, melt in your mouth quality. It’s not a huge block but it’s enough to make the entire meal unforgettable. Like I said, I rarely eat steak or meat but I do remember the very good ones, and this one is up there in top 3 at the moment. But let me explain in more detail why this night was quite memorable. You see it wasn’t just the magnificent food or the wonderful ambience. It was also amazing to witness the Director of Food and Beverage herself, Monica Coppetta really be in her element. She was visible throughout the evening and her command and presence was felt as she directed and led the presentation and timing of the degustation. It’s not an easy task to feed all the guests in synchronized order and Monica and her team did this very wonderfully. Now the ambience. Zombie and I were seated on a table by the water’s edge. And amidst this romantic atmosphere, there were 6-feet nurse sharks swimming underneath us. Especially when the skies became completely dark, and the lights of Salt were attracting the sharks, they were really very active. More so because there was also a huge lobster cage beneath the restaurant — and this is what I mean by having the best and freshest of seafood. I’ve definitely fallen in love with this degustation meal. It was fresh, nicely presented, greatly managed and most of all, it didn’t leave me feeling so full (like you’re drowning in food), as some degustations can go. 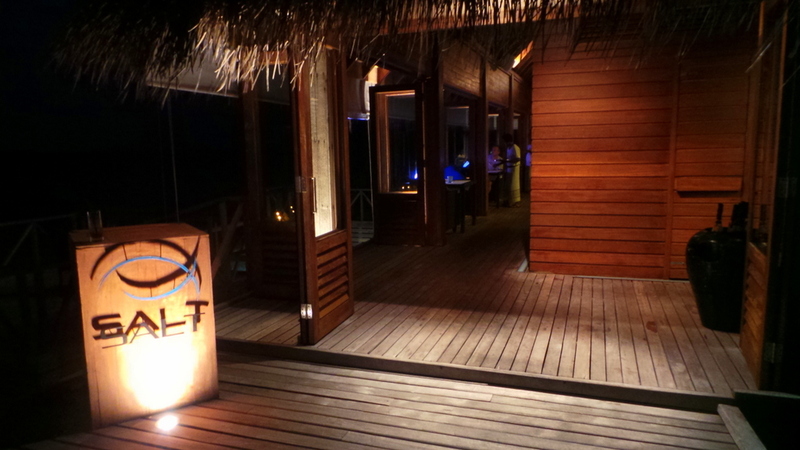 I highly recommend timing your stay at Huvafen Fushi to spend a Thursday night there to experience this.